The availability of nutrients is one of the most critical factors determining the range of kelp distribution (Jackson, 1977) hence why kelp is predominantly found along the coastlines of northern and southern latitudes; although, as Brown et al. (1997) points out: major coastal upwellings, rich in nutrients, such as the Humboldt current and the Eastern Pacific Coastal Upwelling along the east Pacific seaboard, allow kelp to extend into lower latitudes along the coastlines of North and South America. Laminariales require a rocky substrata upon which to fix their holdfast- superficially root-like structures which simply anchor the algae to the seabed and have no other root-like functions. Kelp species vary in size though Macrocystis pyrifera, the Giant Kelp, can grow up to 45 metres in height (Abbott; Hollonberg, 1976). In favourable conditions M. pyrifera can grow up to 2 metres a day, this rapid growth allowing them to maximise the efficiency of photosynthesis. 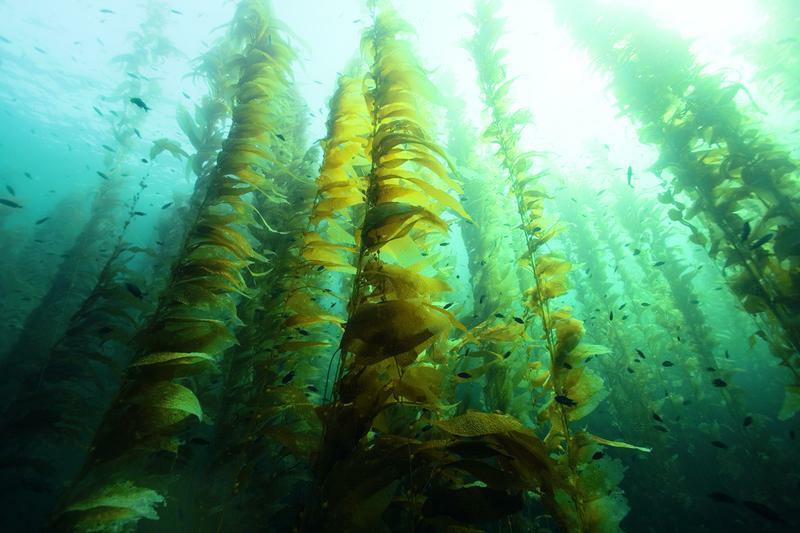 Kelp forests are amongst the most phyletically diverse and structurally complex ecosystems in the world as well as being one of the most aesthetically beautiful. They play a vital role in the sequestration of atmospheric carbon. It is thought that marine primary producers contribute at least 50% of global carbon fixation and may account for up to 71% of global carbon storage (Chung et al., 2010). Although the action of phytoplankton will contribute a significant amount of this percentage, macroalgae such as kelp- which include the largest marine, benthic organisms- will also inevitably have significant impact on reducing atmospheric carbon dioxide concentrations. In a world where climate change is already having noticeable effects, and greenhouse gas emissions are an important topic on the political agenda, any sizeable method of carbon sequestration deserves to be preserved. Of course, like all photosynthetic organisms, Laminariales produce oxygen as a waste product of their light-independent reaction, which all animals require constantly for survival. Kelp forests support a diverse range of species, a majority of which rely on the macroalgae for food and/or shelter and protection. Organisms include invertebrates such as bristle worms, brittle stars, sea urchins, anemones, snails, prawns, jellyfish and octopus. They also support a wide variety of fish, many of which are species that are important to commercial fishing; for example the various species of rockfish. Marine mammals such as sealions and the Grey whale are common in Pacific kelp forests as is the commonly cited South Pacific Sea Otter which is thought to be crucial to the existence of kelp forests. Many bird species such as cormorants, great blue herons and various members of the gull, tern and egret families also rely on the ecosystem for food and shelter from storms. There are numerous threats to kelp forests, of which deforestation; due to the grazing action of certain echinoid species, is just one. It is a fact that invertebrates such as the species belonging to the Strongylocentrotus genus (sea urchins) graze on the holdfasts which anchor macroalgae species to the substrata. Although the holdfasts are strong the Strongylocentrotus have five jaws each with a single sharp tooth which is highly efficient at severing organic tissue. Breaking the holdfast results in the entire thallus leaving the substrata. Stongylocentrus can consume at such a rate that despite the rapid growth rate of kelp the ecosystem has no time to recover. However it has been repeatedly observed that some species, usually the apex predators in the ecosystem’s food web, are effective at controlling sea urchin populations and thus allow kelp forests to grow and expand. 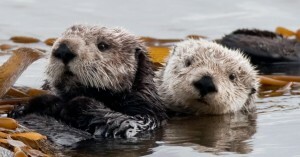 Enhydra lutris (sea otter) is the most commonly cited keystone species in relation to kelp forests. Their efforts have been noted in several locations. For example in Torch Bay, Alaska, (Duggins, 1980) and in Pacific Grove, California (Lowry and Pearse, 1973). In 1998 Estes et al. published an article noting that a decline in the sea otter population in western Alaska, most likely due to an increase in hunting activity by orcas, correlated with an increase in urchin populations and a consequent reduction in the range of macroalgae in the area. Enhydra lutris are intelligent and well adapted for preying on Strongylocentrotus thus making them an ideal predator however other species such as the lobster Homarus americanus are equally effective at preying on sea urchins and in some regions may be considered a keystone species for the same reason. In Nova Scotia, Canada a decline in the Homarus population led to an explosion in Strongylocentrotus numbers (Breem; Mann, 1976). The idea of “keystone species” is becoming increasingly subjective. 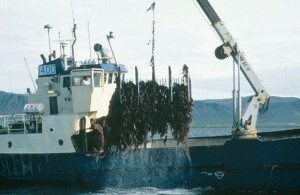 It has been suggested that kelp forests merely go through phases of rapid healthy growth and decreased barren periods (called isoyake in Japan) instigated and dominated by herbivores such as Strongylocentrotus. It may be that sea otters (or any other keystone species) simply mediate between the two phases. (Foster; Schiel, 1988). On the other hand however it can be argued that for many locations sea urchin grazing is the most significant factor in kelp deforestation and therefore conservation of urchin predators is still crucial. Natural ecosystems always have a way of restoring their equilibrium in the aftermath of stress caused by natural events. For example, although storms will damage macroalgae and potentially destabilise individuals from the substrata the ecosystem is capable of regenerating given enough time. 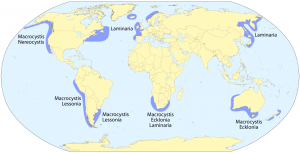 It is anthropogenic activities which pose the greatest threat to macroalgae ecosystems. A major threat is overharvesting. 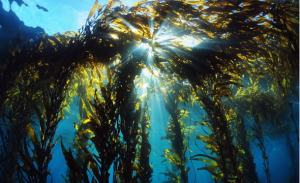 Commercial kelp harvesting supports a multitude of industries which use the compound Algin, a thickening, gelling agent used in food, shampoo, toothpaste, paint, cosmetics etc. It is also used as an effective fertiliser in the agricultural industry. The whole industry in worth approximately $40 million a year. Other anthropogenic activities which threaten kelp forests include over-fishing, pollution- from sewage and waste disposal- coastal runoff and sedimentation burying any new growth. The damaging effects of storm surges and alterations in the ENSO (El Nino Southern Oscillation) and other ocean currents as a result of climate change can even be attributed to anthropogenic activities. The conservation of marine ecosystems such as coral reefs and mangrove swamps generally takes precedence in peoples thinking however it is vitally important that all marine ecosystems are protected- or at the very least, respected- especially ones as diverse and amazing as kelp forests. Steneck, Robert S., et al. “Kelp forest ecosystems: biodiversity, stability, resilience and future.” Environmental conservation 29.4 (2002): 436-459. Brown, M. T., et al. “Seasonal growth of the giant kelp Macrocystis pyrifera in New Zealand.” Marine Biology 129.3 (1997): 417-424. Chung, Ik Kyo, et al. “Using marine macroalgae for carbon sequestration: a critical appraisal.” Journal of Applied Phycology 23.5 (2011): 877-886. Duggins, David O. “Kelp beds and sea otters: an experimental approach.” Ecology (1980): 447-453. Lowry, Mr LF, and J. S. Pearse. “Abalones and sea urchins in an area inhabited by sea otters.” Marine Biology 23.3 (1973): 213-219. Foster, M. S., and D. R. Schiel. “Kelp communities and sea otters: keystone species or just another brick in the wall?.” The community ecology of sea otters. Springer Berlin Heidelberg, 1988. 92-115.